First up, Johnny Jump Up! I adore this quilt, it was the first one I designed for this group. Jacob said I was crazy when I showed him, that it was beautiful but “a lot of work!” But everything that’s worth something takes a bit of work, right, and I happen to know you quilters have mad skills. So I’m not worried. You’ve got this. :) Regular piecing or paper piecing options are both included in the pattern. Depending on if you choose Low Volume or Scrappy, it can be made with Layer Cake Squares or Fat Eighths. I love how different the two versions look, just by changing up the alternating squares. The scrappy quilt, I quilted with a cool angled x pattern, the texture is awesome. I quilted the low volume quilt with a fun spirals and circles pattern. It’s such a contrast to the angles and straight lines of the quilt itself. I can’t wait to see your versions! This one is about as quick and easy as they come! 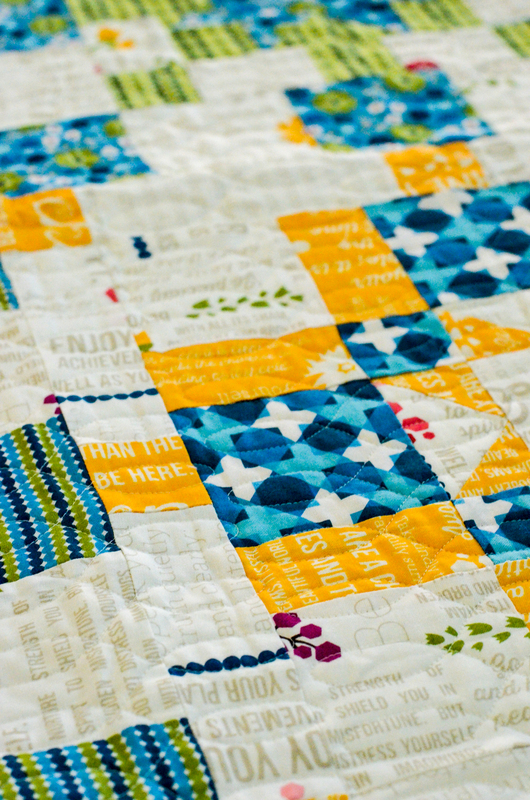 Made with 5″ charm squares and some fun background fabrics, this is a fantastic baby quilt that you can make up in an evening. Literally. And it turns out so fun every time! Another awesome thing about this quilt? You don’t have to piece the backing! If you’re quilting this quilt on your home machine, you can get away with a single piece of backing fabric. 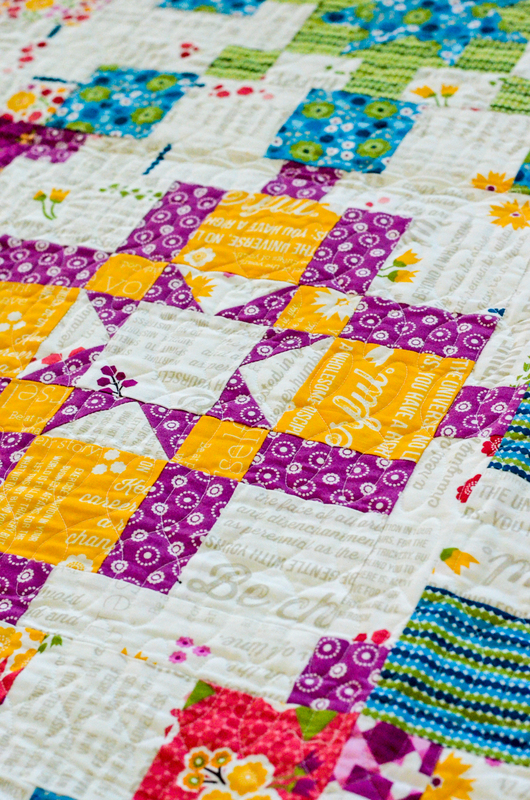 If you’re working with a long arm quilter, you can check with them to see if they need more room to play…but either way, you’re going to get a kick out of this quilt. SO, start collecting charm packs my friends, because this is one quilt you’re going to make over and over and over. Of course, because I’ve been thinking about baby for the last year, my next pattern is a great car seat cover and swaddler. Introducing Cuddly Car Seat! I adore this pattern because it’s so DARN useful! Of course, the car seat cover is useful for keeping little tiny ones out of the sun, away from prying eyes, and giving a little quiet place for a nap. 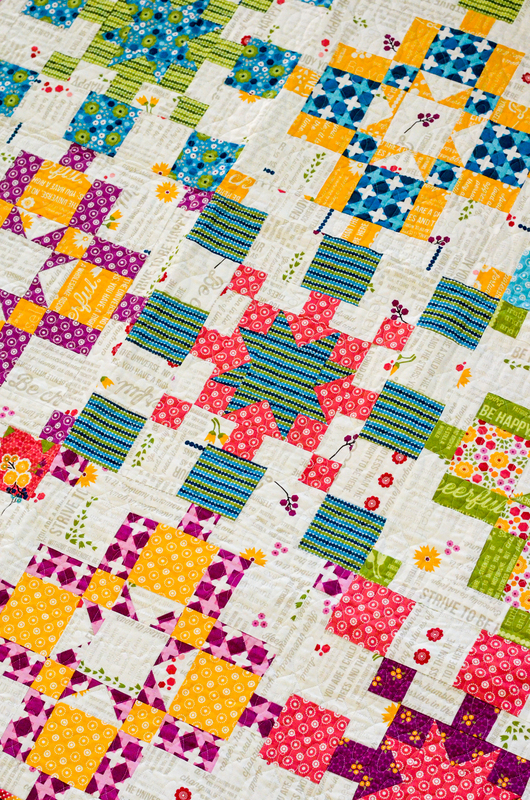 And, who can resist a Jelly Roll project? 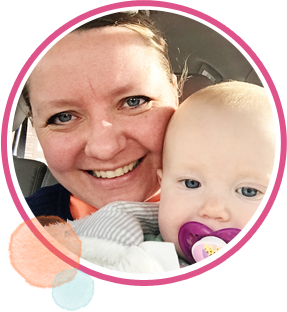 The swaddler is awesome because it has holes in it so it can be a permanent blanket in the car seat. This is SO nice for windy of chilly weather! Simply buckle in that little sweetheart, and then wrap the blanket around them. They’re safely buckled, and also nice and warm. Gotta love that. 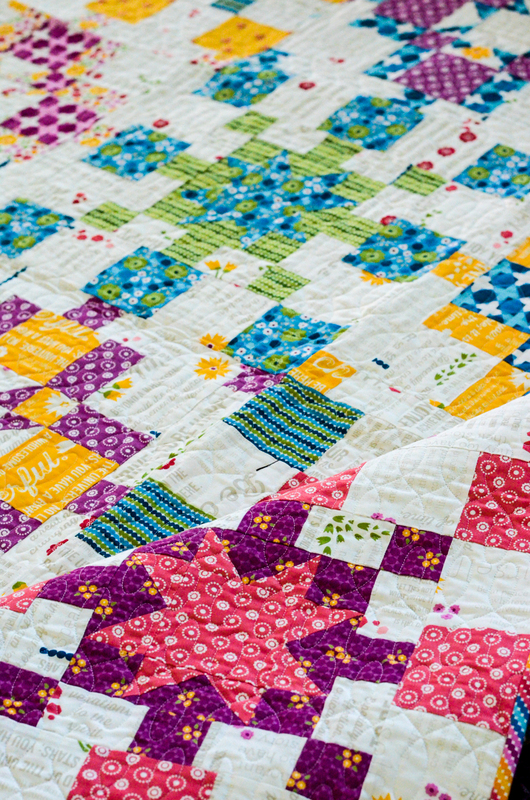 It is a stunning beauty of a quilt that makes me just so darn happy. Big blocks and seams that nest make this go together quickly and precisely. 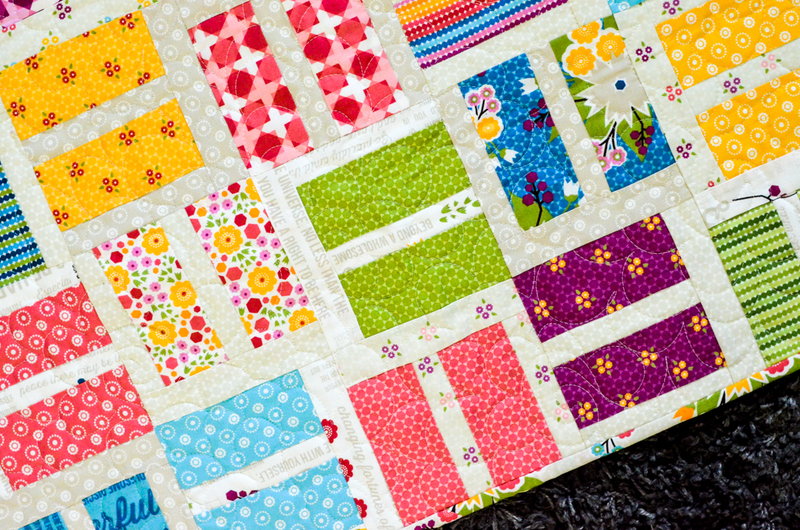 This quilt reminds me of fireworks in July, sprinklers in August, bonfires in June. I literally can’t stop looking at it. It’s a square throw sized quilt, with just 16 blocks to make. I’m going to need a two color version in solids just as soon as possible. 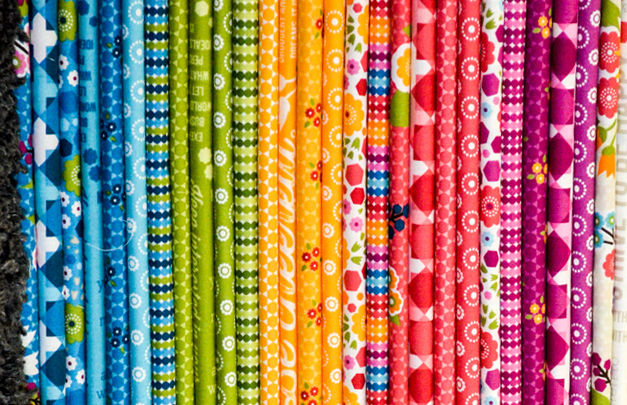 Made with fat quarters friends, so break out those bundles and get sewing! I always think I can’t possibly love another quilt more than my last one, and every time, I’m wrong. I love this quilt. Love. 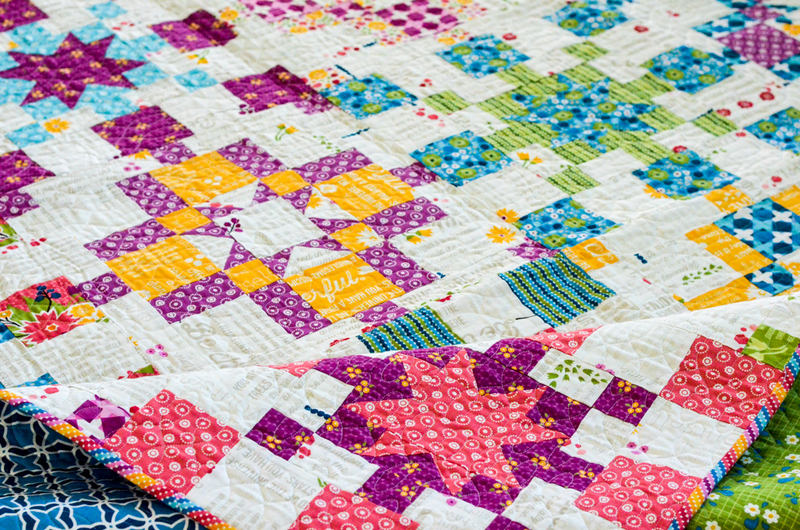 I’m so happy to share these with you, and I can’t wait to see all the beautiful quilts you will make! Thank you so much for sharing this amazing hobby with me, and making it so fun to do what I do every day. You truly are the best. New patterns are in the shop. Mwa! Beautiful and tempting as always! Building blocks is my favorite! The prints are just wonderful!! WOW and WOW!!! Meadowbloom is beautiful, fun, and I want it!!! The patterns are all ‘swoon-worthy’! Great job, April!!! So fun!! What great new patterns!!! Every piece of that fabric is a lovely breath of fresh air. So, so beautiful. And those patterns…I swear…are your best yet. Congratulations, again. Ohhhh, how you tempt me to become a quilter. Gorgeous! I am LOVING the charm pack baby quilt! Dear Ms. Rosenthal, I purchased your solstice pattern with fabric from Craftsy because my 27 year old daughter loved the fabrics and pattern. I have been re-reading the pattern and comparing written instructions to the photos, and can only conclude that several important instructions have been left out? How many blocks should each fat quarter contribute to and should block A fabrics be used for second block B or should they stay only with A? That’s all the questions I’ve figured out so far, but I haven’t started cutting yet. Thanks for your attention. PS: I am a fairly experienced quilter. I won a Cake Mix recipe and a meadow bloom layer cake and have purchased a solid layer cake and it shows how to make the 5 different blocks but I don’t have a picture to see how the quilt is made up can you tell me where I can get a picture or instructions?